The big events in France over the summer are the usual Craponne Country Rendez-Vous (27-29 July), which features this year, as well as some leading US country artists, the Steeldrivers, Ronnie Bowman, and Howlin' Fox. 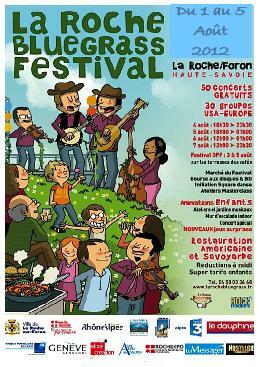 One week later (1-5 August) is La Roche Bluegrass Festival. This is a FREE festival with thirty bands from all over Europe and the USA. Headlining this year is Ronnie Bowman, Bearfoot, and Hickory Project from the US, They Call Me Rico (Can), Blackjack (Cz), Le Chat Mort (S), and Turquoise (F). The festival is family-friendly with plenty to do for kids and bigs, and good locally-produced food and drink on site. Between these two festivals is the international La Roche Summer Bluegrass Camp led by Pierre Bastide with Hickory Project and French tutors. This successful camp has been growing in popularity thanks to the great teaching of Hickory Project. See more here. Meanwhile, the different regions around France are getting more active with weekend sessions in the home, so if you are travelling in France this summer go see the FBMA internet forum for details (there is an English section).